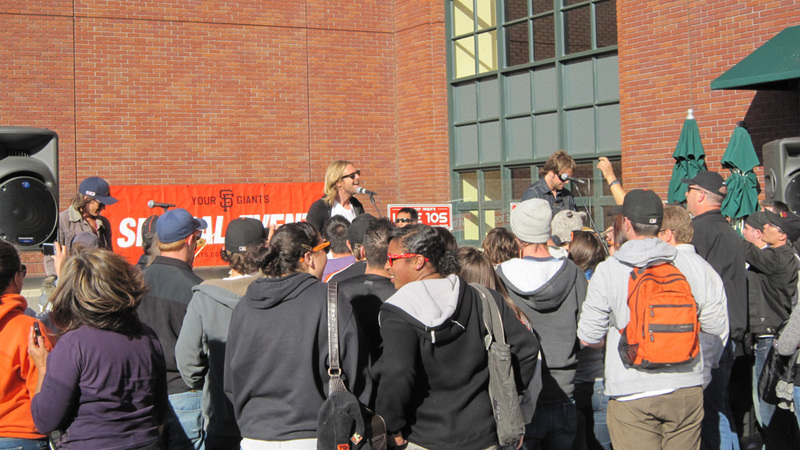 Tuesday wasn’t just Carnaval Night at AT&T Park, it was the first installment of the Giants’ new pregame concert series, this one featuring Switchfoot. Fans purchased special tickets to attend the acoustic set on the Club Level Terrace, and they got their money’s worth, as radio station sponsor Live 105 DJ No Name encouraged all fans in attendance to get ridiculously close to the object of their musical affection. So enthusiastic was the crowd (even beyond the young woman who kept screaming, “We love you, Switchfoot!” and eventually snapped a tabletop off its pedestal when she stood on it) that lead singer Jon Foreman had to chastise fans for cheering when he announced they were from San Diego — the Giants were taking on the Padres later that evening. Fun sidenote: When the ballpark opened 10 years ago, what is now the Club Level Terrace was originally a port and cigar bar area. How times have changed.